Today's great recipe idea for Meatless Monday and other nutritious vegetarian suppers. The filling is slightly sweet, slightly hot, a big mess of zucchini, mushrooms, tomato and beans – a great base to easily adapt with what's on hand or just sounds good. With a vegan cheese, the tacos are not just vegan but "Vegan Done Real". With more vegetables and/or protein instead of beans, the filling meets the requirements of both paleo and Whole30 diets. For Weight Watchers? The filling is just three PointsPlus for a whole cup! You're gonna love this one, I promise! BACK IN 2007 Did I mention I love-love-love Rick Bayless' Mexican Everyday? I do! This recipe is one more reason. It makes an excellent quick supper of tacos, infinitely variable, completely delicious. And then? The leftovers are just excellent for a simple lunch! Next time, I will go easy on the canned chipotle pepper and its adobo sauce. This turned out hotter than pleasant – not inedible-hot, not eye-watering hot, not mouth-burning hot, just hotter than pleasant. I added a can of hominy in an attempt to quell the heat, turns out, it was a great addition! UPDATE So seven years passed after making these tacos the first time – and then I made them three times in as many weeks! Each panful has been slightly different but starts with the onion-mushroom-tomato-chipotle mixture, then gets vegetable and protein additions we have on hand. It's a real winner for Meatless Monday and other nights when "quick" and "nutritious" guides the dinner choice. ZUCCHINI-MUSHROOM FILLING In a skillet, heat the oil til shimmery. Add the onion and cumin, sauté til onions soften and begin to brown. Add the mushrooms as they're prepped, stirring often until mushrooms release their liquid and begin to turn color and shrink down. Meanwhile, in a blender or small food processor, purée the tomatoes, chipotle and adobo sauce in a blender. Add to the skillet and let cook down a bit, until the consistency of tomato sauce. Stir in the zucchini and any other vegetables, let simmer until zucchini becomes soft but now mushy. As it cooks, season to taste, do taste and see if you want to add more chipotle in adobo sauce. Be sure to really let this "cook" and not just warm up. 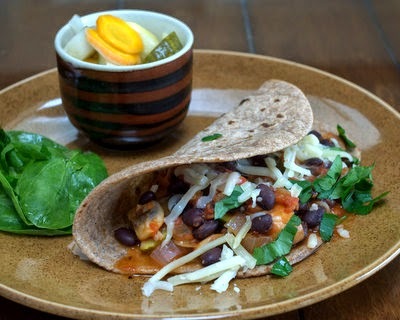 TACOS Warm tortillas in a skillet, fold in about half-cup of Zucchini-Mushroom Filling plus cheese and fresh cilantro. Dig in! LEFTOVER REPORT I love this for supper but really love it left over for lunch. A 50-calorie corn tortilla, a scant half cup of filling warmed in the mike, plus a tiny spoonful of something 'cool' like Greek yogurt or cottage cheese plus a slice of roasted red pepper and/or chopped lettuce, some cilantro and salsa. Call it lunch in five minutes flat, for all of 100 calories. Take THAT to the weekly weigh-in, won't you? CHIPOTLE IN ADOBO SAUCE Look for this in small cans, you'll use just a bit, the rest can be stored in glass jar for months where it's ready to be used, any time. I used to leave the chipotles whole, then spoon out the adobo sauce that keeps it moist a teaspoon or so at a time. Now when I open a new can, I run the whole canful through a mini food processor, that means no mashing/fussing around later. For this recipe, I've used a teaspoon of this mix, also two teaspoons, how much you use will depend on your taste for heat, this stuff is spicy! I suppose it's not "necessary" to blend the tomatoes and the chipotle but it does break down the tomatoes into something more sauce-like, it also distributes the heat throughout the sauce, there's no risk of an unexpected single "very hot bite". If you don't have any chipotle in adobo sauce, sriracha or another hot sauce would work fine but I'd add a splash of Liquid Smoke or a teaspoon or so of smoked paprika too. SOMETHING STARCHY I adore the nuttiness of hominy but it's harder to find, not as typical to keep on hand. Black beans are a great substitute, so are other beans such as pinto or even red kidney. QUESO FRESCO I in love-love-love with Mexican queso fresco, much like the uuni justo (oven cheese) I ate all the time when living in Finland. Small world, our planet! I also choose another Mexican cheese called cotija, it's got an addictive sort of sourness. NUTRITION INFORMATION Zucchini-Mushroom Filling Only, Per Cup: 109 Calories; 3g Tot Fat; 0g Sat Fat; 0mg Cholesterol; 515mg Sodium; 17g Carb; 5g Fiber; 5g Sugar; 5g Protein. WEIGHT WATCHERS POINTS Old Points 1.5 & PointsPlus 3 CALORIE COUNTERS 100-calorie serving, a scant cup. Adapted from Rick Bayless' Mexican Everyday by restaurateur, TV chef and cookbook author Rick Bayless. Mmmm...that looks so good! I need to find a copy of this book, we love Mexican-inspired so much, and this looks great. Also have never tried queso fresco...maybe I'll get it in TJs? Thanks for the inspiration, Alanna. Trader Joe's, perhaps, but you know my favorite place, Global Foods in Kirkwood, which has recently started expanding its "Mexico" selections ... one aisle over from "India" so not so far for you, once you're there! Sounds very good. I'll have to look for those tortillas. They sound perfect for me. I sometimes use the ground chipotle chile pepper from Penzeys instead of the canned chipotles, which cuts down the hotness a little, but still gives that lovely smokey chipotle taste. agree, alanna. that's a great book. thanks for posting this rcipe. This looks really scrumptious Alanna. i love the combination of zucchini and mushroom. Ho, I think that Hominy is a brilliant idea in a taco! I wish I could find those tortillas, those sound lovely at 50 cal. Kalyn ~ The tortillas are definitely worth seeking out. I'll watch for the chipotle pepper too, I'm lucky to have a Penzeys store nearby. Bee ~ This cookbook reveals food SO different from the standard fare at "Mexican" restaurants and especially "Tex Mex" places. This is stuff we can make ALL the time. Meeta ~ Ah yes, zucchini and mushrooms work great together. And the good news of course is that lots of odd vegetables are perfect, here. This is home cooking, after all, so it's kitchen versatile! Tanna ~ I've been tucking hominy into lots of things since first trying them here. Yum!! yum! I'll have to try this. Love Hominy. Love Rick Bayless. Love chipotles. Love TACOS!! thanks for the recipe. I'm excited to be finding other st. louis food bloggers. This looks really good. It's funny how great Mexican food is actually pretty light and super delicious. Maybe that's why I cook this kind of stuff so often at home. It's a far cry from the generic American-Mexican food I usually get in restaurants.